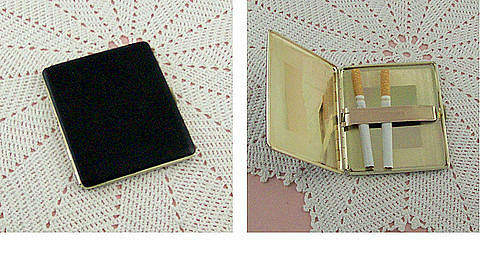 This listing has a vintage Hickok black leatherette – could be leather, not certain -- cigarette holder or case. It measures 4 ¼” x 3 5/8” x ¼” and is perfect to put in a jacket pocket or carry in a purse. It kinda smooshes king size cigarettes (see photo) so perhaps it could be used for something else like lots of money??? 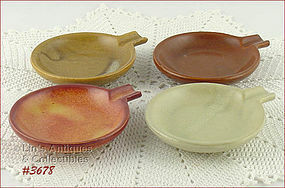 This listing has 4 McCoy small, party size ashtrays! Measure 4” diameter, 4 ¾” long (at longest), and are marked McCoy, USA. Ashtrays are in excellent condition. Nice! These unmarked McCoy ashtrays are such neat collector items! Ashtray measures 2 ¼” tall, 7 ¾” diameter, and is in excellent condition. Super! 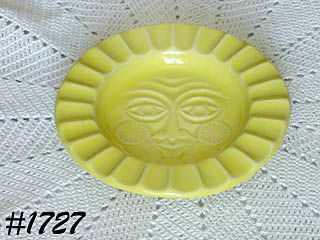 This neat ashtray is the same golden yellow color of most Happy Face (Smile) items! There is one major difference – it has a frowning face! 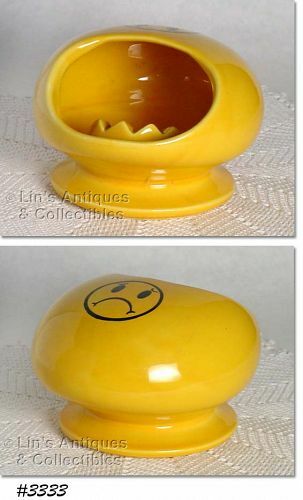 I’m not certain if it’s a “don’t smoke” frown or a “put your ashes here” frown – either way, it’s a most unusual piece of unmarked McCoy and a rare piece to add to a collection! This is a cute item – it’s a miniature lighter! Measures 1 ½” x 1” x ¼”, is gold color, front has “LORTOGS”, and it’s in the original box. Neat! 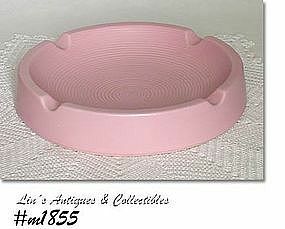 This is not your everyday Shawnee item – it’s a large pink ashtray! Measures 8 1/8” diameter, 1 ½” tall, and is marked on bottom: Shawnee, USA, 214. It’s in excellent condition – has a teeny 1/16” glaze ding on rim – that’s it!! 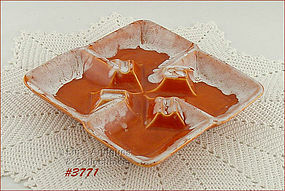 These are too pretty to use as ashtrays but that's what they are -- a set of 4 ashtrays by Davar Originals! I don't believe they have ever been used because each one still has the original Davar foil paper label/sticker. This listing has an unmarked McCoy cuspidor from the 1920s! It is a pretty green color and measures 5 1/8" tall, 7 3/8" diameter. The design is a grape cluster and panels (panes). This listing has a very nice McCoy cuspidor! It's a light green (minty) color, has grape clusters with leaves and panels (panes) design on front and back. Cuspidor measures 5 1/8" tall, 7 1/2" diameter. It is in excellent condition -- no chips, no cracks -- does have some crazing. It has some typical production McFlaws, interior glaze pops and some glaze runs/skips -- of no consequence! 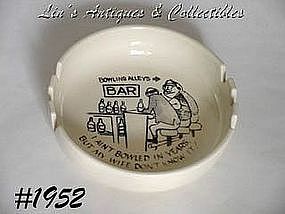 MCCOY BOWLING "SPOOF" ASHTRAY! THIS ONE DEPICTS 3 GUYS SITTING IN A BAR -- LOCATED AT THE BOWLING ALLEY. ONE OF THEM SAYS "I AIN'T BOWLED IN YEARS, BUT MY WIFE DON'T KNOW IT!" NICE SIZE ASHTRAY, MEASURES 2 1/8" TALL, 7 3/4" DIAMETER. HAS NO CHIPS, CRACKS, OR CRAZING. DOES HAVE SOME COLOR WEAR ON THE LETTERING. 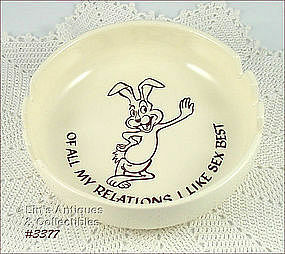 THESE FUNNY ASHTRAYS BY MCCOY ARE DIFFICULT TO FIND AND ARE WONDERFUL COLLECTIBLES. WHAT A COLLECTIBLE! DOUBLY COLLECTIBLE ITEM -- A RUBBER TIRE ASHTRAY AND A FIRESTONE ADVERTISING PIECE. THIS IS A LARGE TIRE, MEASURES 2 1/4" TALL, 6 1/2" DIAMETER. MARKED: FIRESTONE (AND TRADEMARK F INSIDE A SHIELD), GSR, GIANT STEEL RADIAL. 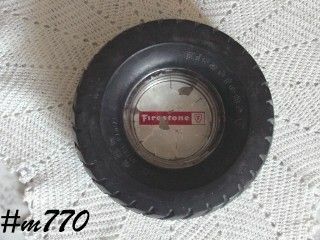 THE CENTER OF TIRE HOLDS A CLEAR GLASS ASHTRAY THAT HAS A FIRESTONE DECAL APPLIED TO BOTTOM. HAS SOME FLAKING. NICE ITEM! NEAT UNMARKED MCCOY ASHTRAY! 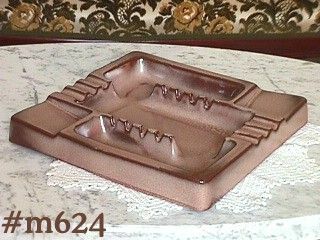 IN THE PRETTY BROWN DRIP COLORS, ASHTRAY HAS A VERY PRETTY SHAPE (ALMOST HEART SHAPED). 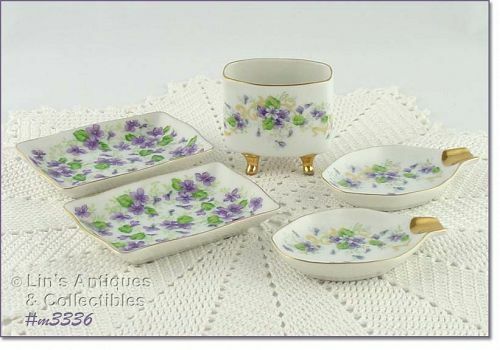 MEASURES 8" WIDE (AT CENTER), 7 1/2" LONG (AT LONGEST), AND 1 1/2" TALL. HAS NO EVIDENCE OF "USE". DRY RING HAS A COUPLE ROUGH SPOTS THAT I BELIEVE TO BE PRODUCTION -- ONE HAS GLAZE AND NEITHER SPOT IS DETRIMENTAL IN ANY WAY! NICE ITEM. VERY NICE! 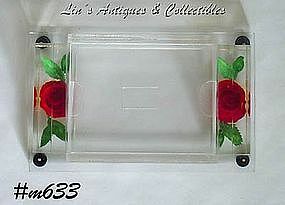 THIS IS A CIGARETTE BOX FOR YOUR VANITY OR COFFEE TABLE. MEASURES 6 1/2" LONG, 4 1/8" WIDE, 2 1/2" TALL. THE HOLDER (BOX) PART IS 3" WIDE, 4" LONG, 1 11/16" TALL. IT IS CLEAR AND HAS AN ENCASED RED/ORANGE ROSE WITH GREEN LEAVES AT EACH END. 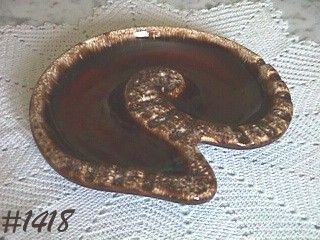 WHEN I PURCHASED THIS ITEM, I THOUGHT IT WOULD BE A WONDERFUL DESK ACCESSORY TO HOLD BUSINESS CARDS, MINTS, ETC OR A NICE VANITY ITEM TO HOLD JEWELRY ITEMS -- HAS LOTS OF POSSIBLE USES. 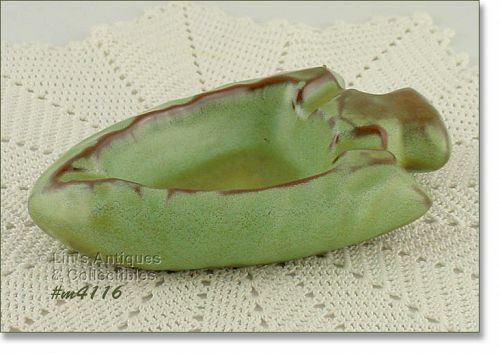 This listing has an exceptional and difficult to find Frankoma ashtray -- a really large ashtray! It is in the pretty light brown color of satin brown and measures 10 1/2" wide, 10 1/2" long, and 1 3/4" tall. Bottom is marked: Frankoma, 464. Ashtray is in excellent condition -- no chips, no dings, no cracks, no crazing!